The Pinoy Informer: Are You Under the Thirteenth Zodiac Sign? Are You Under the Thirteenth Zodiac Sign? I read from Claire's and Caroline's blog about the new zodiac sign for the European Horoscope. The thirteenth zodiac sign is named Ophiuchus. Ophiuchus, according to Wikipedia, is a large constellation located around the equator. It is usually treated as the thirteenth zodiac sign by some astrologers. Ophiuchus is a constellation that represents a man that holds a serpent, which is represented by the constellation Serpens. 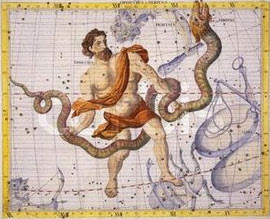 Ophiuchus was listed by an astronomer named Ptolemy and is considered as one of the modern constellations. According to some astrologers, Ophiuchus is the only zodiac sign that is referenced to real persons that existed in history. Some astrologers say that the thirteenth zodiac sign represent the 27th Century Egyptian doctor Imhotep or the Bilical Joseph. Other astrologers say that Ophiuchus represents the Sumerian god Enki. In Japan, Ophiuchus is popular and he is called as hebitsukai or the snake messenger. Ophiuchus is considered as a healer or a doctor of medicine or science. Therefore, people under Ophiuchus have inborn talents in healing techniques and are excellent doctors or medical practitioners. Also, people under the thirteenth zodiac sign seeks enlightenment and higher education. People under the thirteenth zodiac sign are expected to acheive high position in life. The symbol for the thirteenth zodiac sign is a capital letter U that is superimposed with a tilde (~). The news about Ophiuchus became hot when an astronomer Parke Kunkle announced the existence of a thirteenth zodiac sign located between Scorpio and Sagittarius. The reason for the addition of the thirteenth zodiac sign is the wobble of the earth's axis in relation to the sun. The wobbling of earth is a contniuous process and the positioning of constellations and other heavenly bodies are different when astrology started as compared to the positioning of constellations today. This is the reason why Ophiuchus was being considered as an additional zodiac sign. Here is the new zodiac calendar. Notice that Ophiuchus was placed after Scorpion and before Sagittarius. So, are you under the thirteenth zodiac sign? Do you believe is astrology? Do you believe that that Ophiuchus should be added to the list of zodiac signs? hmm...i've read something from nbc that this is just some sort of social experiment and not true. But well, leo na raw ako ngayon! Rawr! Isa ka ng leon...so handa ka nang manlapa? You can always be a Sagittarius because some astrologers don't want to use the thirteenth zodiac sign. hhahah..this is really interesting for me..thanks for sharing Ish. So am no longer Virgo? hehe awwrr na rin?..hehe! Don't want 2 use the new one!! You are not alone. Many people don't want the thirteenth zodiac sign. They are comfortable with it. Thankfully I'm not under the influence of the thirteenth zodiac sign. I have heard a lot about this issue but got a clear idea from this post. Thanks for this data.